Kolam is the name given to the art of Rangoli in the southern parts of India, mainly in the states of Tamil Nadu and Kerala. The Hindus residing here use of this art form daily and on festive occasions. Kolam is regarded as a sort of painted prayer in South India. The design usually comprises of a symmetric line drawing, which comprises of curved loops, drawn around a crisscross pattern of dots. A few Kolam examples are shown below. 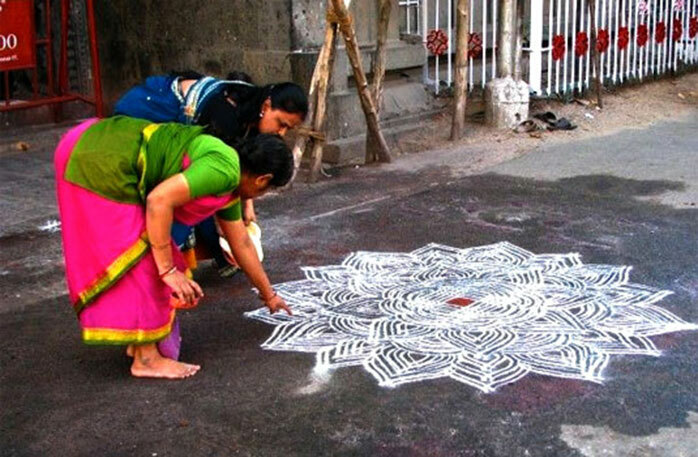 In South India, making Kolam designs is an everyday ritual. Since the one drawn on the previous day gets walked on or rained out or blown away, new ones are made on a daily basis. The womenfolk of the household get up every morning before sunrise and clean the entrance to the home with water. 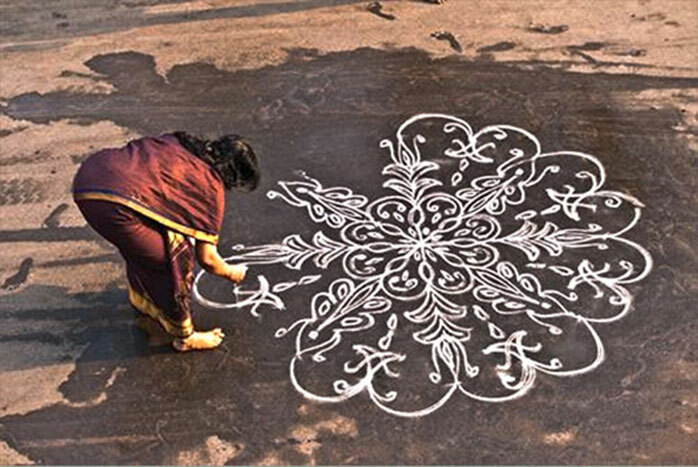 Thereafter, the kolam is drawn on the damp surface, (where it adheres better) with the help of rice flour. Limestone powder and red brick powder (which gives a bright maroon colour- kaavi) are also used on special occasions. Though the design is usually drawn with the help of dry rice flour, diluted rice paste is also made use of, especially when one intends to keep the kolam for a longer duration. At times, paints and chalks are also used to enhance the kolam along with the usual ingredients. On special occasions, such as marriages, pujas, festivals, kolam patterns can stretch all the way from the courtyard of a home to the street. 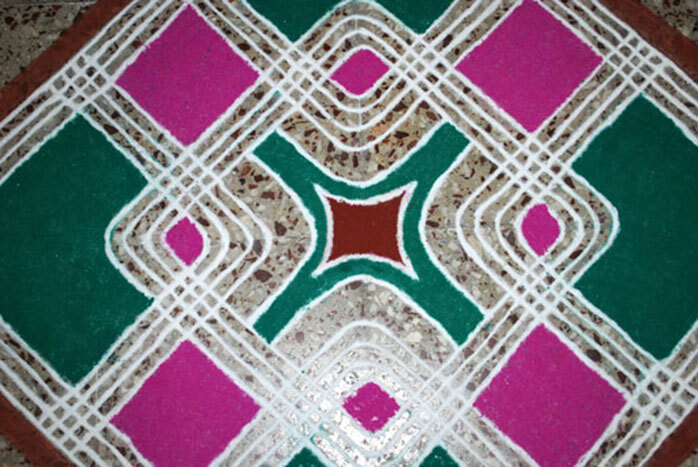 It is believed that kolams drawn at the entrance of a home bestow prosperity and success to its residents. 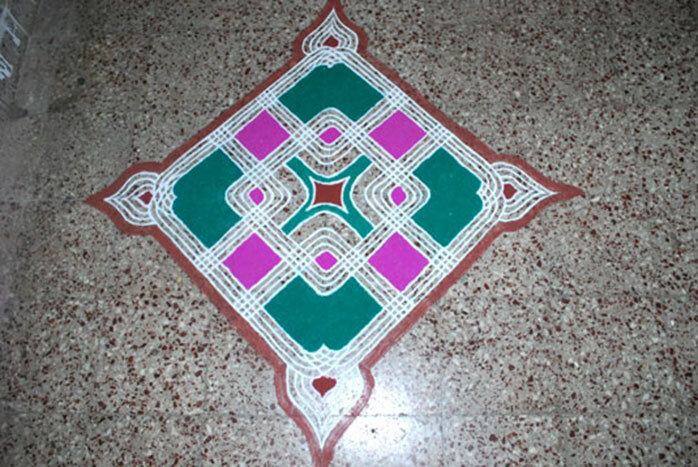 It is said that in a kolam design, the lines must be completed as unbroken lines prevent evil spirits from entering inside the design, and along with it, inside the home. 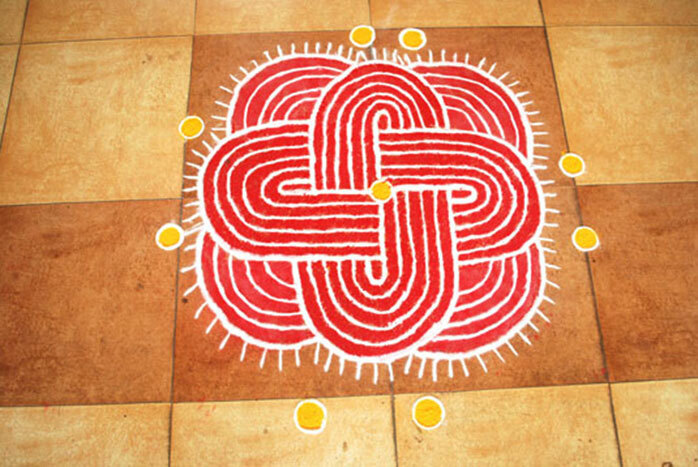 The kolam, and the bright red border or’ kaavi’ enclosing it are also believed to prevent evil and undesirable elements from entering the homes. The kolam patterns are often passed on from generation to generation, like from a mother to her daughter. Kolam art of Tamil Nadu and Kerala are less ostentatious than other forms of Rangoli, but have a unique beauty of their own. Women are so skilled that these patterns are drawn by bare fingers, deftly without making any mistakes and also in the right size and proportion as per the space available in front of a home or in a large courtyard or a festival hall. Kolam, apart from being used for decoration, also serves other purposes, and has important spiritual aspects to it. One of the uses of Kolam is to provide food to ants, insects, and small birds like sparrows, since the designs are made with the help of rice flour by woman of the house who is considered as Annapoorneshwari or the nourisher of the family, the first thing in the morning; they act as a source of food. Hence, the kolam represents man’s concern for all living creatures or Annadana (giving food to others-indicates generosity). Thus, kolam - the design is a sort of invitation to all, especially Goddess Lakshmi - the Goddess of prosperity, into one's home and life. A Puranic story highlights this. While the Devas and the Asuras were churning Parkatal (Ocean of Milk) for amirtam (nectar), many things started coming out of the ocean. Goddess Lakshmi too came out of that ocean and requested Lord Vishnu for an abode for her to reside. The Lord said that she could stay in houses where the entrances to them were sprinkled with cow dung water and decorated with kolams. Next came Moodevi -the Goddess of misfortune. She too asked for a place to reside. Lord Vishnu directed that she could stay in dirty houses where they would not draw kolams at the entrances. From then on, people began to draw kolams not only to invite Lakshmi into their houses, but also to keep Moodevi away from their houses! Kolam is a kind of Mandala, (to borrow from the Tantric terminology of the Hindu Tantra). It is the residence of the deity one is praying to or invoking. That is perhaps one reason why drawing certain kinds of kolams acquire a ritualistic mode. The movement of the hands in a particular direction are based on the Tantra. In some cases the creation of the kolam follows the rigors of the Indian architectural definitions i.e is the Stapathya kala where one follows the defined parameters. Kolam creation is a repetitive act which is performed every day in the morning preferably at break of dawn at one’s threshold. This repition is crucial as practicising this art brings order to one’s life. 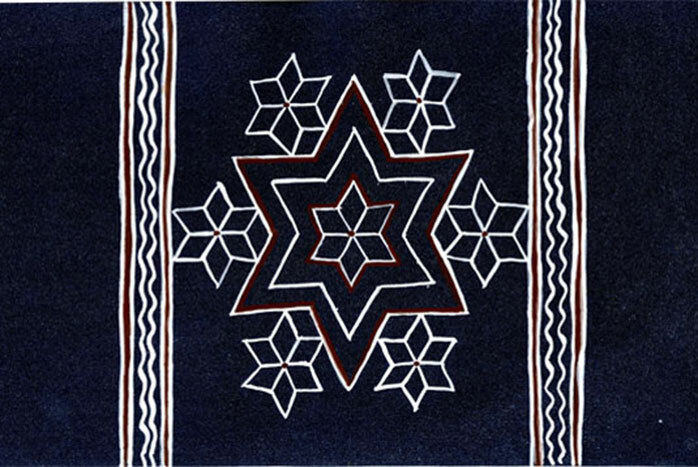 Since the designs are usually symmetrical the symmetry of the inner cosmos connects to the outer order. It is believed that if one is in a disturbed state of mind one cannot create a kolam, so a sense of serenity is very essential during kolam execution. Some of the kolams begin with a dot (Bindu) which is defined as the centre of the universe and the kolam creation around it is likened to the journey of self expression or creativity. There is also the aspect of impermanence that each day the kolam of the previous day is cleaned away and a new one takes its place akin to the belief that Hindus have about the impermanence of the human body. Apart from the spiritual aspects, there are health benefits of kolam making too. Since one has to bend down to make the pattern, it serves as an overall stretching exercise for the body and also helps in improving the functioning of the digestive system and reproductive system. The ability to draw large complicated patterns without lifting the hand off the floor for long periods of time is believed to be a matter of pride for the South Indians. 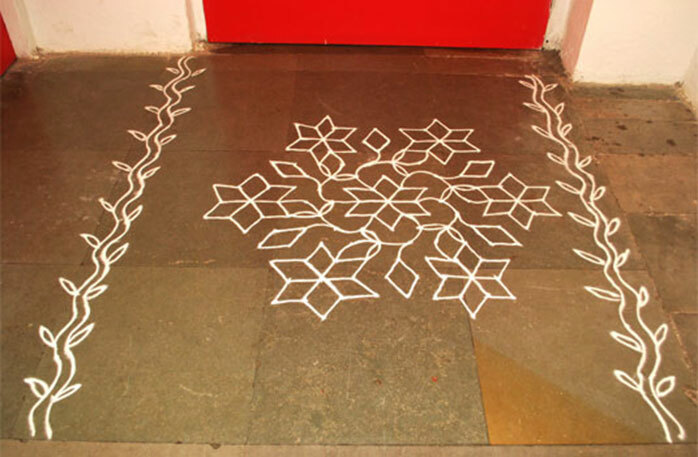 Types of kolam: Kolams too have many themes which keep changing according to the seasons and occasions. A flower with leaves and vines running around it would conform to the natural theme, while fluttering butterflies would belong to the insects theme. There are nautical kolams, and chariot kolams, for different religious festivals like, Pongal (a very important festival in Tamilnadu) Deepavali, Pookolam for Onam, and bells and bows with Santa for Christmas. 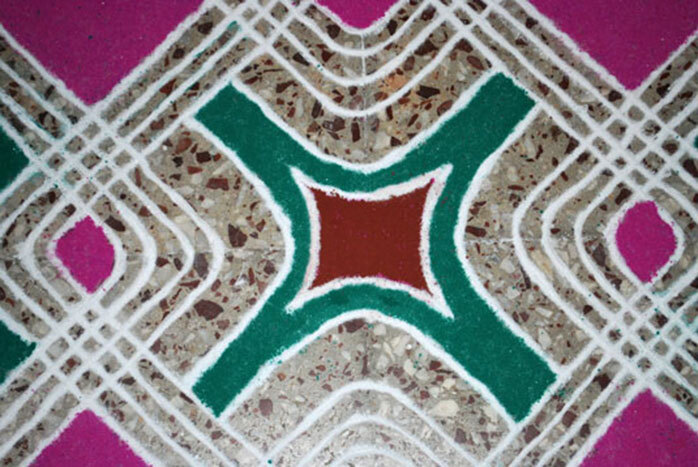 Kolam elements are derived from the specific festival or occasion for which they are drawn. 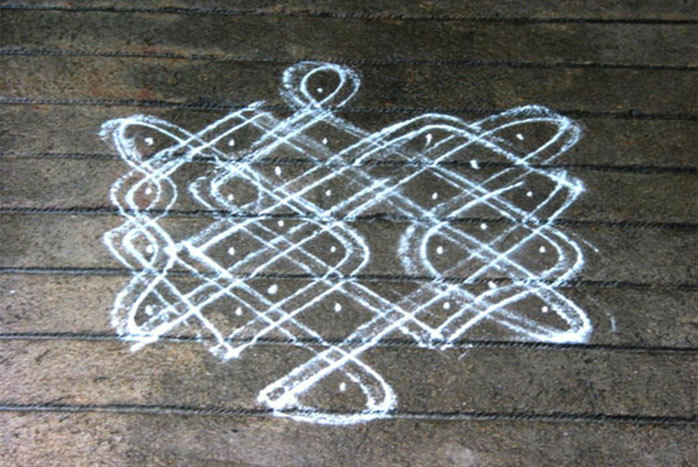 There are kolams for every week done in front of the home entrance or in the open courtyard inside the house. These are done with the help of chalk or rice powder with respect to the worship of the different planets on that particular day. 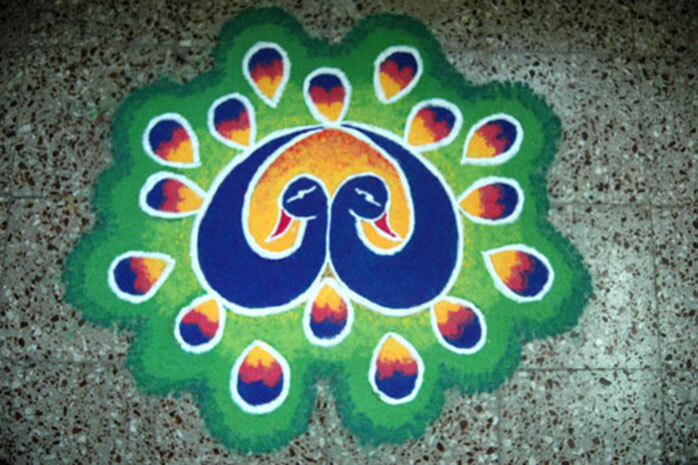 So there are seven different types of kolam for each day of the week, which also use different colours indicating the colour of the significant planet of that day. There are also different icons used in the kolam, unique to each day of the week. All these different types of kolams are explained in a more elaborate manner in the next topic.